It was a little odd to open the Japan Times this morning and find a feature about the city we live in, Inzai; odd in the sense that for as long as we’ve lived here whenever we tell people our address, in almost every case they’ve never heard of Inzai, which is the city just to the west of Narita in Chiba Prefecture. The article, written by Elaine Lies of Reuters, uses Inzai as a model for future growth in Japan, which is seeing its population shrink and age. For this purpose, the article compares Inzai’s situation with that of its neighbor to the south, Sakura, which is aging much more rapidly. The reason for Inzai’s good fortune is what Reuters sees as its aggressively pro-growth outlook. Inzai is one of the three cities that are part of the Chiba New Town development project, while Sakura is a typical suburban bedroom community that was developed in the 70s-80s during the lead-up to the Japanese bubble period. Though it includes some neighborhoods, like Yurigaoka, which was planned around an offshoot of the Keisei Main Line, that continue to attract young families, for the most part Sakura is made up of isolated housing subdivisions that no one is really interested in any more, probably because most of them are far from train lines. Inzai, on the other hand—or, at least, the part of Inzai that Reuters was covering—is built along the Hokuso Line, which also happens to follow Route 464, a major road that goes from the edge of Tokyo almost to Narita airport. In fact, the first item in the article that raised any eyebrows on our part was the factoid that says Inzai is 40 minutes from the airport. Actually, if you take the Airport Access train from either of Inzai’s two express stops, it’s only about 20 minutes, so we suspect the reporter got her information from someone who drives to Narita. As of now, 464 doesn’t reach as far as the airport. After it gets to the town of Sakae, you have to take back roads to get there. 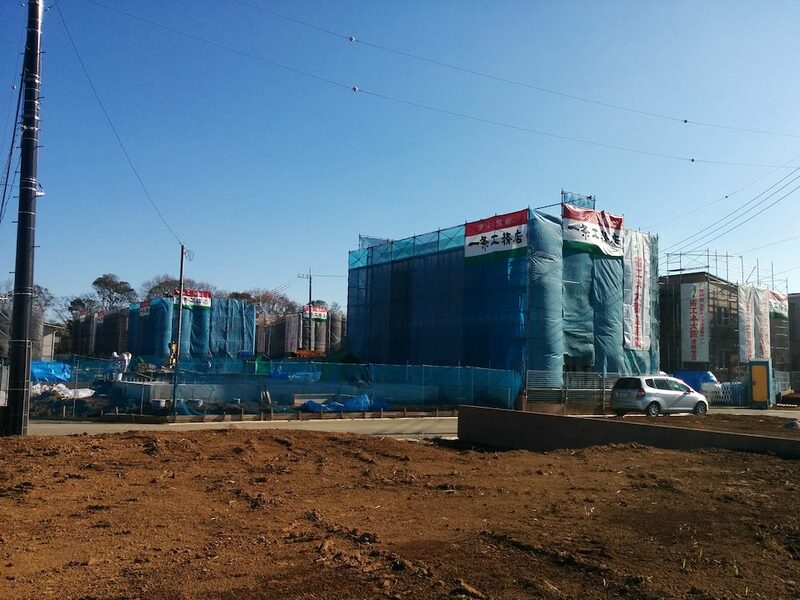 Further on from our April Home Truths column about temporary housing for evacuees in the Tohoku region, local governments in the area are also facing another related problem: an oversupply of permanent public housing built expressly for victims of the Great East Japan Earthquake. These are apartment buildings, not unlike public housing complexes erected in other parts of Japan, that accept people who were left homeless by the disaster and were either already living in public housing destroyed in the disaster or who were living in their own homes and, for whatever reason, do not plan to rebuild those homes due to financial limitations or age. Here’s this month’s housing column in the newly designed Japan Times. This one’s about emergency housing, which we’ve talked about before but we never really got into the legal aspects, which are quite interesting. Here is our latest Home Truths column, about public housing in Japan and, more specifically, Tokyo. One point inadvertently removed during the editing process is that Tokyo’s public housing system is called toei jutaku. Koei jutaku is a general term for all public housing, anywhere. 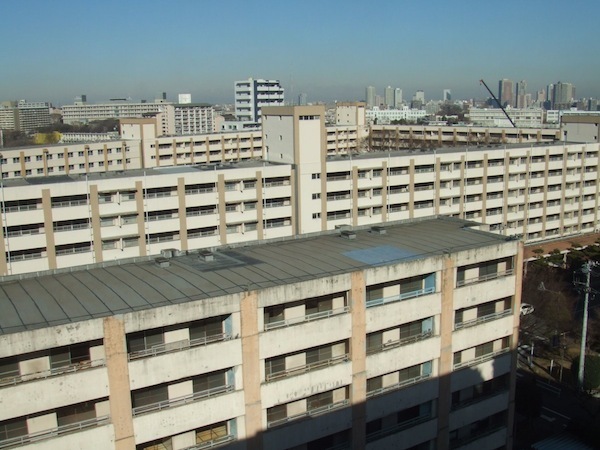 Kuei jutaku is public housing facilities run by an individual city ward (ku), etc. It’s become an almost trite litany in the media: the poor become poorer and the rich richer, with the middle class mostly shrinking and absorbed by the former. The conventional narrative says that free market capitalism makes this so, as governments in the free world become “smaller” and thus less likely to regulate economic functions. But more fundamental to the issue is the idea that priorities are shifting away from the poor. An article in the Dec. 3 Nihon Keizai Shimbun reports on a survey completed by the Ministry of Internal Affairs and Communications in September and just released to the public. The survey collected data from local governments regarding public buildings, including apartments and schools. 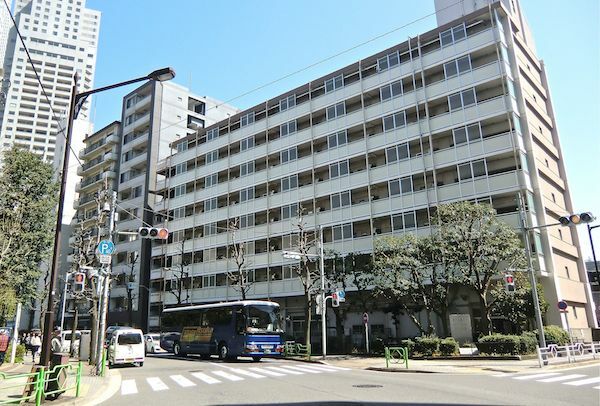 One of the more startling statistics is 12,251, which represents the total number of these buildings that local governments throughout Japan, both prefectural and municipal, want to tear down. The estimated cost of this mass demolition would be ¥403.9 billion, a huge burden for municipalities, most of which are cash-strapped anyway. But the cost of maintaining these buildings is probably higher, since it’s an ongoing expense. The reasons local governments want to tear down these buildings is simple: they’re old–the average age is 41 years–and the population is expected to continue decreasing. This number doesn’t include buildings that will be renovated or replaced after they are destroyed. It’s only buildings that will be gone for good. At the time the survey was conducted, 40 percent of these buildings were in use, while 47 percent were not in use at all and were thus shuttered. As far as plans for demolition go, 32 percent will be torn down “within a year or two” while the fate of 41 percent was “not known” at the time. Here’s this month’s Home Truths column in the Japan Times, which is about the Chiba New Town development project, where we happen to live. To clarify something that may not be apparent in the article, it’s a very nice place to live. As pointed out, the people who reside here enjoy a mix of urban convenience and unspoiled nature, though one of the points we tried to make is that if the New Town scheme had gone ahead as originally planned, it might have been more congested and less attractive, but it was never going to happen that way because of the area and the way it was developed. As it is, the urban sectors have plenty of well laid-out parks, the roads are all lined with wide sidewalks and bicycle lanes (which few people use since everyone drives), there are plenty of retail outlets offering a wide variety of very cheap merchandise, and just minutes’ walk from any station in the NT area you are in deep countryside: rice paddies surrounded by well-kept forests. And while the Hokuso Line is expensive, it is extremely convenient to both central Tokyo (one hour to Nihohbashi without transfer) and Narita Airport (20 minutes), and, probably because it is expensive, it’s never crowded. Based on a rough survey of the land being developed now for residential homes, lots of approximately 200 square meters will be going for ¥10-15 million, or about ¥50,000 per square meter. So far, tracts being prepared are located 10 to 25 minutes by foot from Inzai Makinohara Station. We haven’t seen too much land being prepared near other stations. When the project started in the 70s, condominiums were promoted, and there are still some large condo complexes near the various stations in the NT area that have vacant units. One, called Doors near Inzai Makinohara Station (five minutes), is only about half filled. Apartments were first put on sale more than two years ago, and since then the developer has decreased the price at least twice, which probably upsets people who already bought. You can get a brand new condo of 70 square meters for only ¥19 million, but if you go a little farther from the station you can probably have a house built for less than ¥10 million more than that. UR, who will be selling most of these plots to real estate and housing companies, will want to get as much money as possible in order to pay down its debt, but with so much being developed at one time and demand unknown, it’s likely that those prices will come down in a short period of time. Chiba, of course, is the cheapest place to live in the Tokyo metropolitan area, and since its population decreases every year, it will become even cheaper just for that reason. Though the New Town has been a failure in terms of what a New Town is supposed to accomplish fiscally, Chiba New Town is a reasonably priced, attractive alternative to its counterparts in other places in the Kanto area. And now that we think about it, maybe that’s the reason Inzai was selected as the most comfortable city in Japan. 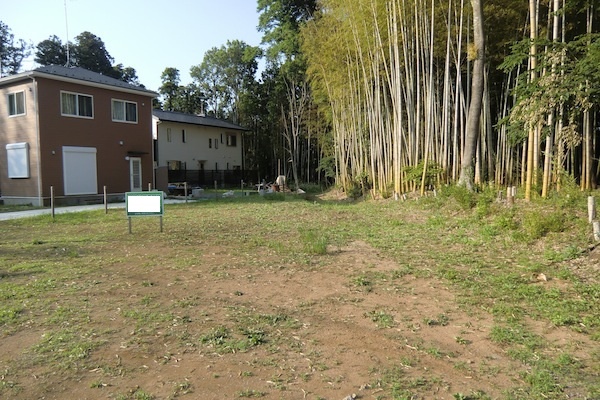 Having lost interest in the land in Makinosato, we felt as if we’d retreated to square one. There was still that lot near Shimosa-Manzaki station, but besides being really cheap it didn’t offer anything we could get excited about. Our disinterest was rooted in the same feeling that made it easy to drop the Makinosato plan: We didn’t really want to live in a subdivision, though we also understood that if we wanted to remain in this particular stretch of Chiba Prefecture and weren’t going to pay more than ¥5 million, the only lots we could afford were in subdivisions. This feeling turned to something like despair when several large tracts of land close to our train station were suddenly opened for development. As mentioned elsewhere in this blog, we live in what is called Chiba New Town, which stretches across parts of three cities in northern Chiba Prefecture. As a housing and commercial project developed by the government housing authority in the 1960s and 70s, management eventually fell to the authority’s semi-private successor, UR, which was stuck with a lot of land that was never developed because Chiba New Town didn’t attract residents and businesses in the numbers the government originally envisioned. But the government has also given UR a deadline to get out of the land development business and that deadline is next March. 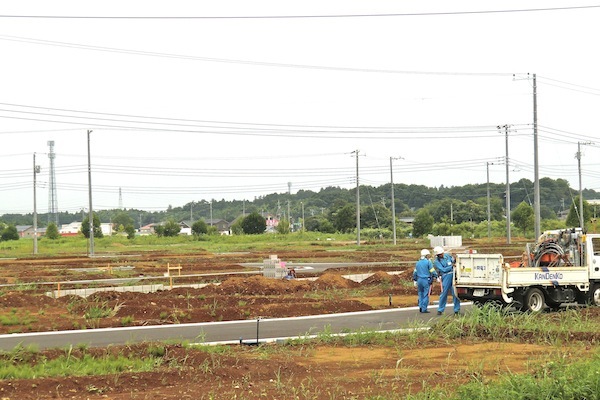 So suddenly, all these overgrown fields bordering the Hokuso Line are being bulldozed and subdivided, and several weeks ago housing companies and real estate agents started advertising the plots, which start at about ¥11 million for 200 square meters. So even though there will be hundreds of plots made available soon in subdivisions we would probably prefer not living in, we at least have to double our land purchase budget in order to buy one.